This topic presents the detailed step-by-step instructions how to update text (which is usually referred to as "search and replace") in many Microsoft Word files. Select the Microsoft Word Files tab. process all files in a directory of your choice. The latter option is more for the power users. If you are reading this topic then an assumption of you being a novice user is more than fair, so let's focus on the files. The standard Windows file open dialog will show up. Select one or more files and click Open. There is one important thing to mention. 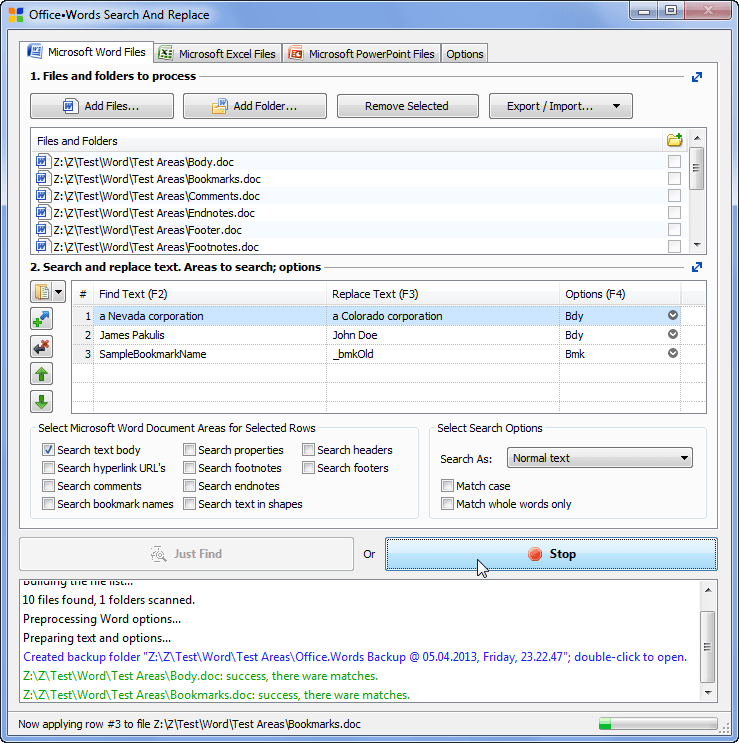 The checkboxes you see on the right: are used with folders only, to denote that the folder's subfolders are also to be scanned for files: With files, these checkboxes are inactive and have no effect. Now set the find and replace strings. Assume your company is moving from Nevada to Colorado, and your CEO is also changed. When you start the program for the first time, a sample row is automatically added to help you get started. If you deleted all the rows form the search/replace grid, add one by clicking on the left. 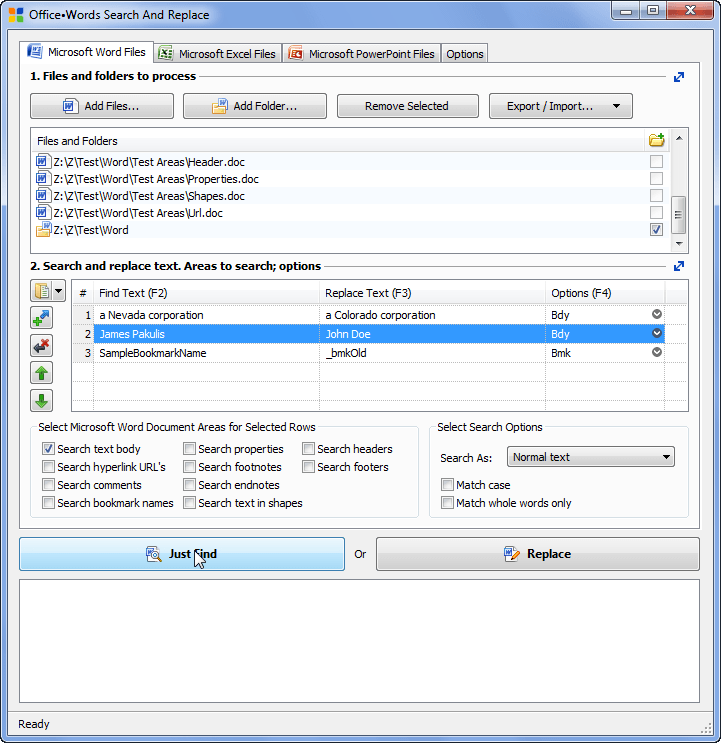 To select areas in which the text of the current row will be searched for, you can click the third cell (in the Options column). Here, we have selected to search for the corporation and CEO names in the document body. Add more search and text as required. Here's the final setup: We have added a third row just for the purpose of this demo. Notice that you can change the search areas for more than one text row at a time: just select the rows and use the checkboxes in Select Microsoft Word Document Areas for Selected Rows group. That's all! Now you can use up the time you've just saved for something useful like playing Solitaire.